When life-threatening illness or injury strikes, every second counts. 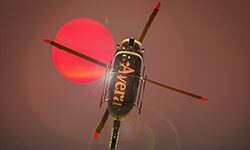 Emergency transport from Avera’s rapid and reliable Careflight services may be critical to survival and recovery. 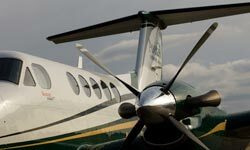 In a region with a large, widely-scattered rural population, rapid emergency air transport is essential. Careflight brings this state-of-the-art technology to people throughout the region from its base locations in Sioux Falls and Aberdeen. Careflight helicopter – For shorter distances, our Eurocopter H-145 and two Eurocopter EC-145 helicopters provide smooth, quiet emergency transport. Emergency vehicles – Ground ambulances provide high quality critical care during transport to and between medical facilities. Careflight paramedics maintain certifications in advanced cardiac life support and trauma care. Careflight nurses have critical care experience and hold certifications in trauma nursing and advanced cardiac life support for both adult and pediatric patients. 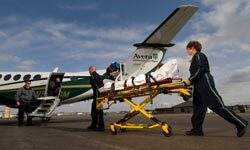 Throughout your transport, your Careflight medical crew constantly communicates with Avera eCARE™, Specialty Physicians and trauma team members. You’re virtually within the trauma center while still in the air. Why Consider Careflight for Your Family? If you suffer from serious or chronic health conditions, live in a rural setting, are elderly, or simply want to be prepared in case of an emergency, a Careflight membership may be right for you. As a member, you receive full coverage for Careflight’s emergency medical air transport services for yourself, spouse and dependents. Your insurance carrier will be billed and their payment accepted as payment in full. If you don’t carry medical insurance, but are a Careflight member, your costs will be covered through your membership. While you don’t have to be a member of Careflight to utilize it as an emergency transport service – a membership simply ensures that you are fully covered. If you have questions about the Careflight membership program or application, please contact the Avera Foundation at 605-322-4759. *Careflight membership covers you, your spouse and unmarried dependent children under the age of 26. Any dependent age 26 or over, who is incapable of self-support because of a mental or physical disability, will need to purchase a separate Careflight membership. 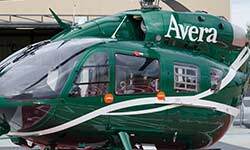 Avera Careflight is accredited by the Commission on Accreditation of Medical Transport Systems, the industry's most respected stamp of approval for all aspects of air safety and quality. Aviation services provided by MRIS, LLC and Avera McKennan. For more information call 1-800-EMS-FAST (1-800-367-3278). Careflight has helped thousands of people throughout the last 30 years. Watch three incredible stories of how they save lives every day. Careflight covers a 125-mile radius across the Upper Midwest. View the Careflight service area map to see where we fly. Check our interactive map to find the Avera emergency department closest to you. Then, view that hospital’s location profile for more facility details.